Mom! Dad! I can explain! 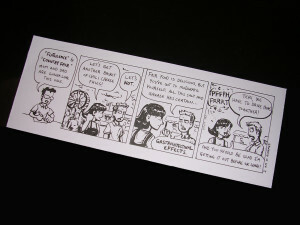 This strip was inspired by Penny Arcade’s new reality show, Strip Search. When two contestants are up for elimination, they have 90 minutes to create a comic strip incorporating two randomly-chosen themes. I (and other cartoonists) have been playing along at home, but I was horrified to discover that the most recent elimination round featured the themes of “flatulence” and “country fair.” I struggled mightily for 90 minutes to create the most tasteful comic I could within the constraints of the challenge, but there is only so much one can do. Blame Mike Krahulik and Jerry Holkins, not me! Clearly this is entirely their fault! The original art for this strip is straight-up available in the store, if for some reason you wish to own something so indecorous and crude. You make me proud to call you my cousin. I think. Well, it’s important to consider these things thoroughly. I like any woman who has the confidence to release gastrointestinal effects in public. Go Teri! I’ll get the air freshener! This isn’t the first time I’ve made the comic.